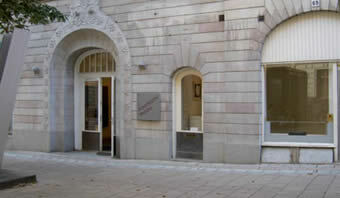 In 1981 the KONSTRUKTIV TENDENS, the Constructivist Tendency Gallery, opened its first exhibition, and during the following years Monica Urwitz’s gallery has consolidated a growing reputation as an imaginative and innovative centre for non-figurative art. The gallery remains faithful to these original principles and now represents both established and emerging artists from Sweden and abroad. A wide network of contacts and joint ventures with galleries in Germany, Britain, Switzerland and Italy has thus enabled KONSTRUKTIV TENDENS to present a rich flow of artists and their works to Swedish art lovers. The gallery is located in the Östermalm district of east-central Stockholm in what had been, from 1909-1968, a popular cinema.